The Rimon Project, at Milan Expo 2015, showcases Jewish jewels like Viadana in Sabbioneta, Mantua and Piadena, while a special smartphone application guides the visitor through the Expo events and many Jewish sites in Milan and Lombardy: kosher restaurants and food shops, bookstores, shopping places and Italian Judaica. “Nourishing the planet, energy for life”, Milan Expo 2015 is the largest-ever event devoted to food, nutrition and sustainable development. For more than 140 countries and International Organizations, from May to October this Universal Expo will be the window to show the world how to respond to a concrete vital need: guarantee healthy, secure and sufficient food for all, while respecting the planet and its ecological and social equilibrium. An 1.1 million square meters exhibition area for an event addressed to anyone interested in the latest food technologies, developing ideas and sharing solutions for a sustainable future – while also discovering each country’s best in food and gastronomic traditions. leaders such as UN Secretary General Ban Ki-moon: in October he will receive the Milan Chart, a global food deal proposal that took two years of debates to develop and highlights the links between the six-month Expo and the Sustainable Development Goals. There will be hundreds of parallel events in Milan, such as the Leonardo 1452-1519 exhibition at the Royal Palace, 180 consecutive evenings at La Scala and the new Museum of Cultures - MUDEC. Turin is the European Capital of Sport in 2015 and Venice hosts the Biennale. No doubt, quite a few visitors will be Jews and the Jewish Community of Milan, Italy’s second-largest, is preparing to welcome them, under the aegis of culture, solidarity and hospitality. The Rimon Project showcases Jewish jewels like Viadana in Sabbioneta, Mantua and Piadena, while a special smartphone application guides the visitor through the Expo events and many Jewish sites in Milan and Lombardy: kosher restaurants and food shops, bookstores, shopping places and Italian Judaica. The Mosaico website has a special bilingual section on the Expo, with information on what to do, see, buy, eat and drink in Jewish Milan and surroundings. Moreover, the Milan Community will stage an initiative called "Tent of Abraham" in order to welcome visitors with the same hospitality that Abraham practiced throughout his life. This symbolic site is opening in September at the Palazzina Liberty, an extraordinary Art Nouveau building. Other key moments for the Community include the official meeting on September 7th between the City of Milan and a delegation of 300 representatives of Keren Kayemeth Leisrael, which contributed directly to the construction of the Israeli EXPO pavilion, and Noa’s concert at the Teatro degli Arcimboldi in July. The kashrut does indeed fit perfectly with the main theme of ​​the Expo. Beteavon, a Merkos L'Inyonei Chinuch initiative launched in 2014, is the first social kosher catering in Italy, serving free meals to disadvantaged Jews and non-Jews. In a period of economic crisis, the project has grown rapidly and has become a model of inter-religious cooperation and synergy. During EXPO Beteavon will build a sort of sukkah in downtown Milan, to show visitors the positive impact the project is having on the city. Milanese Jewry may well be smaller than in Rome, let alone Paris or London, and yet it is surprisingly visible in the city that is also the world’s largest Catholic diocese. The "Jewish and the City" festival, for instance, attracts thousands of participants in September and is now a regular fixture of the European Day of Jewish Culture. Well-known Jews with strong Milanese roots abound, including Daniel Libeskind. The American architect of the Ground Zero Memorial in New York and the Jewish Museum in Berlin has a house in Milan, where he is also building the new “citylife” residential area. Last but not necessarily least… it is Milan that thousands of Maccabi fans “invaded” in 2014 to cheer the yellow-blue team to victory in the Eurobasket Final Four! The State of Israel will also be present at the Expo. 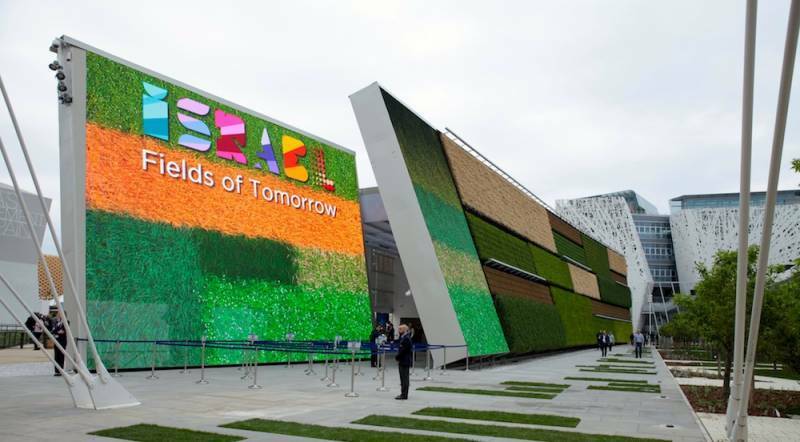 Its "Fields of tomorrow" pavilion is a powerful visual experience that plunges the visitor in a wonderful journey through Israel’s agricultural engineering with a look into the future of mankind. The main attraction will be the "vertical garden" designed by David Knafo: a 70-meter long and 12-high wall, entirely adorned with live plants, whose flowers and colors change with the passing of the seasons. Another initiative is a drip irrigation system installed in farms in Milan, Mediglia, Mantua and in the Padano Technology Park of Lodi, with the cooperation with Israel’s commercial office in Milan. On March 23, World Water Day, KKL Italy Onlus already organized the "Technology and research for the water of the future" conference, with the sponsorship of EXPO 2015. For Milan and other Italian Jewish Communities, Expo 2015 is a unique opportunity to gain visibility, present the peculiarities of the Jewish Italian landscape, and fully develop two thousand years of historical, gastronomical, and monumental heritage. This is also an opportunity to raise funds and awareness of the importance of the Jewish contribution to Italy. But first and foremost it provides the chance to meet new friends from around the world – Bruhim Habaim ​​leMilano! !